[283 Pages Report] Video Surveillance Market research report categorizes the global market on the basis of products, applications, components, systems and geographical analysis; forecasting revenue, and analyzing trends. 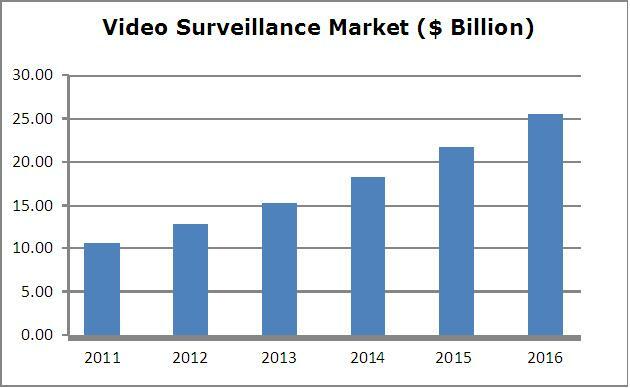 Global video surveillance market is expected to reach $25.43 billion by 2016 at a CAGR of 19.35% from 2011 to 2016. According to a new market research report “Video Surveillance Market - Global Forecast & Analysis (2011 – 2016): By Products (IP, Analog, Remote, Mobile); Components (Cameras, Storage Devices, Software, System Management); Applications (Infrastructure, Commercial, Institution, Industrial, Residential); System Services” published by MarketsandMarkets (http://www.marketsandmarkets.com), the total video surveillance applications market is expected to reach $25.43 billion by 2016 at a CAGR of 19.35% from 2011 to 2016. Browse 67 tables and in-depth TOC on “Video Surveillance Market - Global Forecast & Analysis (2011 – 2016): By Products (IP, Analog, Remote, Mobile); Components (Cameras, Storage Devices, Software, System Management); Applications (Infrastructure, Commercial, Institution, Industrial, Residential); System Services”. There have been notable advances in the field of video surveillance systems over the last decade. The innovation of digital systems has made it swifter and systematic to store and retrieve data as compared to wasting time in watching video tapes. The video surveillance industry is surging rapidly not only in terms of technological advances, but also in terms of adoption in new applications sectors. With the advent of globalization, businesses have expanded and also spread to overseas locations. As a consequence, surveillance systems are now also being used for real-time and remote supervision. APAC offers a lucrative market to video surveillance players. This can be attributed to the developing countries like India, China and so on. The video surveillance market is experiencing a paradigm shift from analog to IP and the players of this market are focusing on developing new products.